Legendary Women, a journalistic and charity seeking platform that promotes positive images of women in the media, interviews Women For Action for the Women's Equality Day Petition. The following is a copy of the interview. Legendary Women: What can you tell us about your organization, Women for Action? Julene Allen: Women For Action aims to tell stories with women at the subject through articles, interviews, images, video/film and social media. There are many initiatives throughout the world that are attempting to enhance the status of women and girls, though our everyday media can only funnel a fragment of those stories. Women For Action curtails its audience by being a forum for these types of initiatives, and is attempting to increase its efforts to promote women and girls in both developing and developed nations. Our content is greatly centered around both national and international issues. Without the entire picture, we can not tell the complete story. The change that happens in one nation, has an impact on the world. We value the roles that women play everywhere. Legendary Women: What are the motivating factors that drive your activism? And what would you say lies at the core of your activism? Julene Allen: I believe in a better world, a society inclusive to women and girls. One of the greatest opportunities we have here in the United States is to be whoever we wish to be. However, there are still levels of inequality. So this is a dream deferred and sometimes denied for some. You don’t have to be an expert or scientist to suggest that such an element exists. You don’t need statistical data to support the facts. It is extremely evident and true that there are gender-biases. I have been in situations and thought I was of equal measure and soon found out that I was not considered equal to my counterparts. Being in the military is a perfect example. Though one may feel as though she is an equal amongst her colleagues, she eventually discovers that she is not perceived in that way. There is nothing wrong with being acknowledged for being a woman. For instance, it’s clear women may have different health needs and the military may make certain accommodations for these, of course. However, it’s unacceptable when one is not respected and valued because of their gender. In order to move up in rank, a woman may need to work twice as hard to prove her value and worth, not just physically, but psychologically. She may need to lose all sense of what it was like being a woman to appeal to the military environment. However, you don’t have to enlist in the armed-forces to be confronted with gender inequalities. Military society is merely a product of the larger culture which is the premise for such prejudices. Having said that, it’s all connected and intertwined. I think it’s so deeply submerged in our teachings, beliefs and behavior that on many levels, it’s unconscious. I wanted to be a part of changing that. I did not want anymore girls or young women to jump into a pot of hot water, sort of speak, without understanding and knowing that there is a real element of danger if you don’t understand the premise of certain behaviors and mentalities. As I became more cognizant of gender inequality, I began to develop a connection to women’s plight in different areas. I wanted to be a part of creating awareness and empowering women so that any thoughts or feelings of inadequacy would be yesterday’s issue. Legendary Women: You’ve interviewed a variety of people from experts on Brazilian culture to concert musicians to human rights activists, do you find there’s a common thread in your works? Julene Allen: Absolutely. My forum is continuously attempting to create awareness about the status of women in different societies. They are all unique. As we continue to explore women in various parts of the globe, we find variation in each story. The story of a woman who is losing her land to the Brazilian government because she lives amongst the Bororos, an indigenous culture within Brazil, will not resemble the experiences of a Grecian business owner who may have experienced some levels of devastation to her country due to an economic crisis. Each obstacle that we face is different, though we all share the great injustice of gender-inequality. Yet what you will find in each story, the remarkability of women’s resilience and how they are working to make either their society or personal lives better. I want my audience to see women as being multidimensional, doing all sorts of incredible things. No one particular storyteller will give us the complete picture. So we gather insight from movie makers, university professors and the narrator herself. I think it’s important to highlight these differences, especially for girls who are searching for their own story. A woman or girl may see a reflection of herself in another woman in a different part of the world. The world is far bigger than the place that we live in. I believe that in order to enhance the status of women, we have to start sharing these incredible stories of women in different nations. Up until now, we have placed limitations on gender which includes men. We need to continue to present more models for women and girls until we reach that place of equality. Legendary Women: What are goals you have in mind not just with The Women’s Equality Day petition but for the future, especially with videos and future interviews? Julene Allen: For one, we live in a society that appears to be somewhat less complex than others. Change can happen here. We’ve seen it. We’ve done it. Our protest of 100,000 women on August 26th 1970 was a testament that women could change things if we all come together. 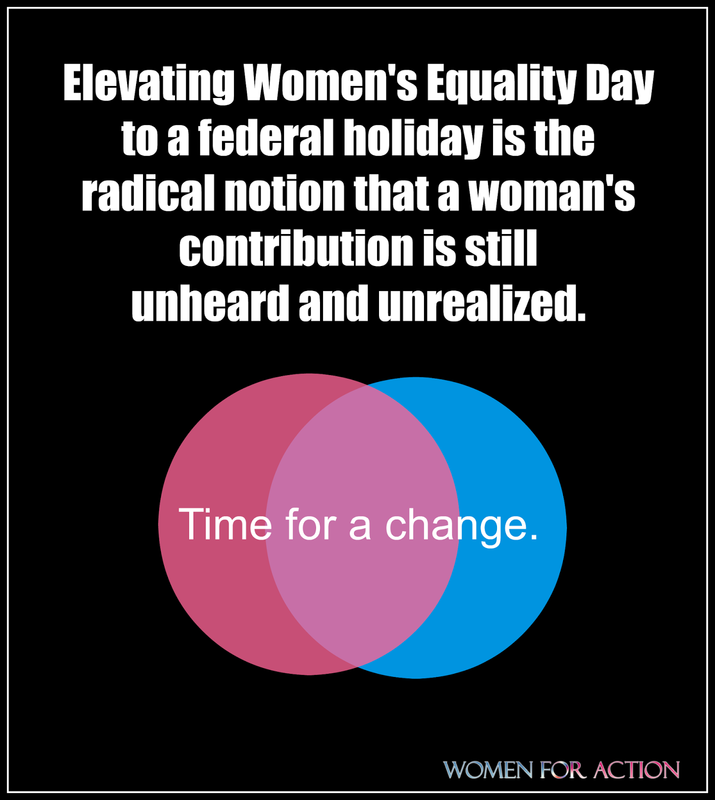 That following year on the same day, we were designated the holiday of Women’s Equality Day. Our mission is that the Women’s Equality Day Petition is visualized as an inclusive initiative for all women here in America. America is diverse and mixed with all sorts of cultural backgrounds. We need all women as allies to realize equality. I think it should be an important agenda for American women to understand these differences and find commonality. The only way we can do that is by understanding the needs of one another. These international subjects that we interview sometimes live right next door on American soil. It’s important to expand our scope on women and connect with our sisters who used to call another country home. Right now we are attempting to expand our mission through interviews and film by highlighting more international cases. We are looking to screen more films that address the needs of women in different societies. Legendary Women: What can you tell us about your staff and mission? Julene Allen: We have a small volunteer staff. Everyone is busy in their everyday lives. Each individual has a passion and willingness to help others. I think it is far more refreshing when you are working with teammates that feel connected to certain issues and want to help any way they can if it is in their power to do so. I think that’s what makes us all feel empowered. Our efforts are being planted towards a better future for women and girls. Each and everyone of us are developing as leaders. I think it’s important for women to be in the driver’s seat and making things happen because we feel as though we are creating and controlling our individual destinies. It’s a dynamic that has a domino effect considering we are impacting the future for women whether our contribution is big or small. If one little girl bears witness, it could change her worldview or how she views herself. 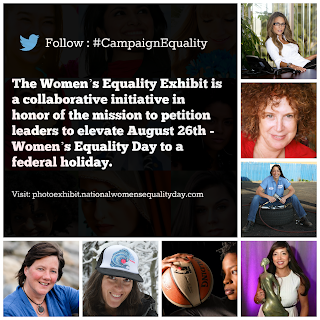 Legendary Women: How did The Women’s Equality Day petition come to be? Julene Allen: Women For Action ‘s efforts are greatly centered around observances. Our platform highlights and commemorates the efforts of women through key dates. We use these days as an opportunity to talk about women’s contributions, whether it’s Veterans Day or even the grim details of 9/11. We aim to tell women’s stories. Our nation’s most significant day for women, August 26th 1920, Women’s Equality Day has not been commemorated in the same manner as some of our other key national holidays. This should be one of the most important holidays of the year. Women were granted the right to vote on August 26th, due to the certification of the 19th amendment. The fact that women were excluded from legislative decisions less than a century ago should serve as a token of reminder of where this nation has been and how much more work needs to be done. The subtle illumination of Women’s Equality Day weighed heavily on my heart. This is one of those initiatives that sits too close to home. It’s extremely difficult to not take it personal. When you reflect on real facts such as women being paid less than men or women having lesser numbers in leadership, you can’t help but to feel as though women are still considered less important. These are just topics that are socially and politically okay to address. Yet we each probably have our own personal bouts with inequality. Still, there are women today that will refrain from sharing their personal stories because they don’t want it to be perceived as offensive to another party . You can say that this petition is a bullhorn for all our sisters in the movement for gender equality. We need a lion’s leap to accomplish more. However, this petition is one of many efforts working towards closing the gap between gender. Legendary Women: Exactly why is it so important for this day to be recognized as a federal holiday? Julene Allen: The status quo isn't working. So the next step would be to elevate the day in some way so it is eminently recognized. In a manner of speaking, the discussion becomes mandated because the day has not been sought out as important! If we start shifting the conversation towards women, we will be realizing an equal more fair world that credits and value women just as it does men. Legendary Women: You also make interesting and salient points about some federal holidays, like Columbus Day, that are outdated and insensitive. Can you elaborate a bit here? Julene Allen: I think when we continue to celebrate a federal holiday such as Columbus Day even after determining that the day highlights more pain, than good, we are not really being fair to our own history. With that being said, it should make us reevaluate where we stand with our history and ask ourselves what can we collectively do to change that. A good place to start is by taking a closer look into what we already know. It wasn't until much recent when researchers felt the need to reexamine some historical records to ensure their accuracy. Some experts are attempting to figure out ways to correct past mistakes as these new accounts are being revealed. Simultaneously, we know the country significantly moved forward on August 26th, 1920 when it acknowledged a large portion of its population for the first time as equal participants to the political process. I think it’s so simple to correct mistakes. If we've collectively come to an agreement that we have highlighted a regressive effort, then it can be corrected for the better by elevating the country's progress. Legendary Women: How long will you be running your petition? Julene Allen: As long as it takes to garner 100,000 signatures. Right now, the petition has been competing with other projects. But Women For Action plans to continue writing and sending out emails to get the signatures needed. Legendary Women: Why should people care about this petition? What makes it so important? Julene Allen: Each and everyone of us have been affected by the women and girls in our lives. 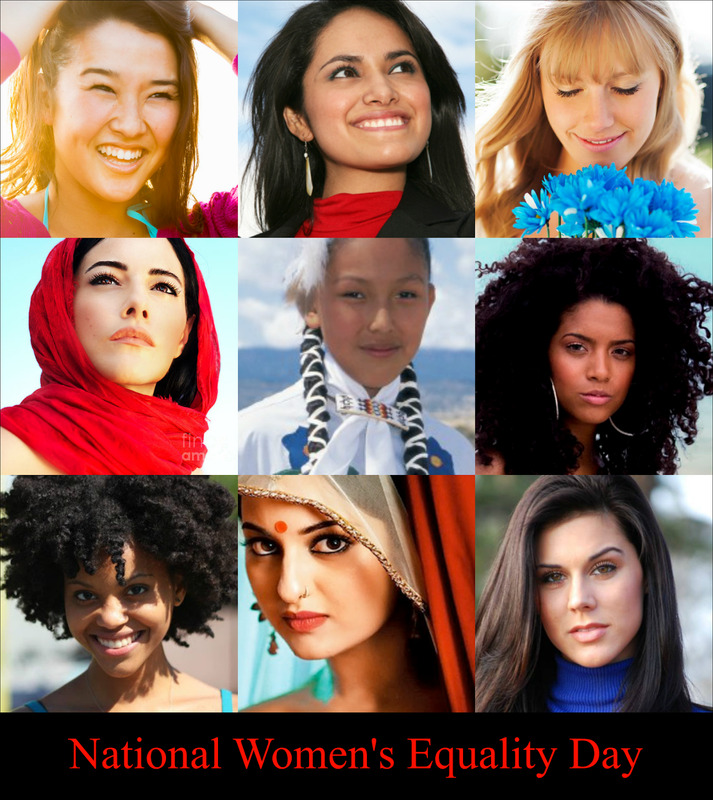 They are our mothers, daughters, sisters, cousins, friends, associates and leaders. When we elevate women and girls- half of the country’s population, we raise the nation. When we start placing an emphasis in women, and deeming them as important contributors, then we are changing the way girls see themselves. Some day these same girls will become our future leaders. Legendary Women: If you had to describe what you hope to accomplish with the Women's Equality Day Petition in three words, what would they be? Julene Allen: Clarity, Collectivity and Completion. Legendary Women: How can people sign it and how can people get involved best in spreading the word? Julene Allen: There are many ways each individual can get involved. Sign the petition and share it with friends, family and colleagues through email and social media. The next thing you can do is have a conversation about the effort with friends and neighbors. Have an open debate and find out what others think. If you have an organization, ask members to support the petition as a call to activism. If you have business, support the petition and Women For Action will graciously acknowledge your effort as being a champion for women. Lastly, you can send us a brief proposal introducing a new idea.We are always interested in hearing what others have to say!